Spotify is thinking about introducing a new paid option in addition to the existing Spotify Premium subscription called Spotify Hi-Fi. For an extra $5 to $10, you could get all the features in Spotify Premium as well as lossless high fidelity streaming. There could also be a couple of new features. The Verge first spotted that the company has been doing tests on its mobile app. There are also tweets and Reddit threads about the new feature so it’s a lot of smoke. It looks like the feature isn’t available to everyone just yet. Spotify is just doing some A/B testing with different prices and feature sets. According to comments on Reddit, the option could cost $5, $7.50 or $10 per month. Once Spotify figures out the most lucrative price, the company will probably settle on one of those three prices. 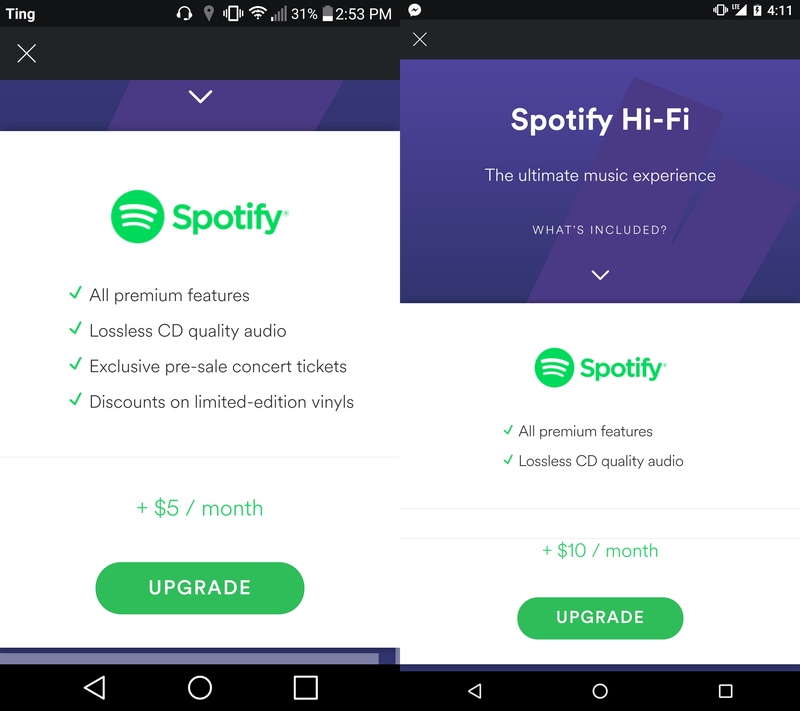 It would include everything in Spotify Premium as well as a couple of optional features, such as a free vinyl, discounts on vinyls and concert tickets. The company is still experimenting with those optional features. What is lossless quality anyway? Currently, if you go into Spotify’s settings and choose the highest quality, Spotify serves you 320kbps audio files. It’s very high quality, but it’s not perfect — in other words, it’s a compromise. This way, files are still quite small and load quickly. Lossless files are perfect copies of the songs on an audio CD. They are then compressed, but without any quality loss. It’s like songs are copied from a CD to your hard drive and then “zipped” to reduce the file size. An average lossless song can be five to ten times bigger than a 320kbps song. If you use a headphone amp and a pair of premium headphones, you may be able to hear the difference. But chances are that you won’t hear the difference if you plug standard headphones into your phone. While this feature won’t appeal to a lot of users, it sounds like a great way to get more revenue from super users. Spotify spends a ton of money on royalty fees. So anything that can raise the average revenue per user is a good thing for the company.